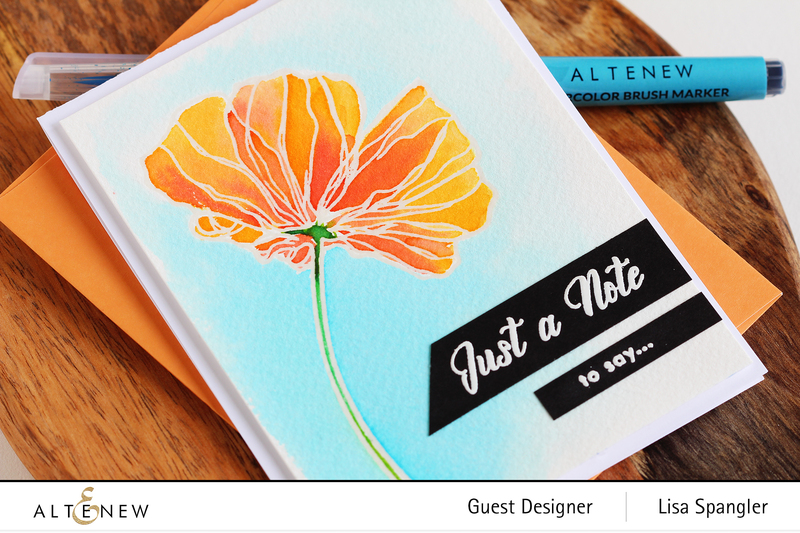 Altenew Watercolor Brush Markers Release Blog Hop + Giveaway! 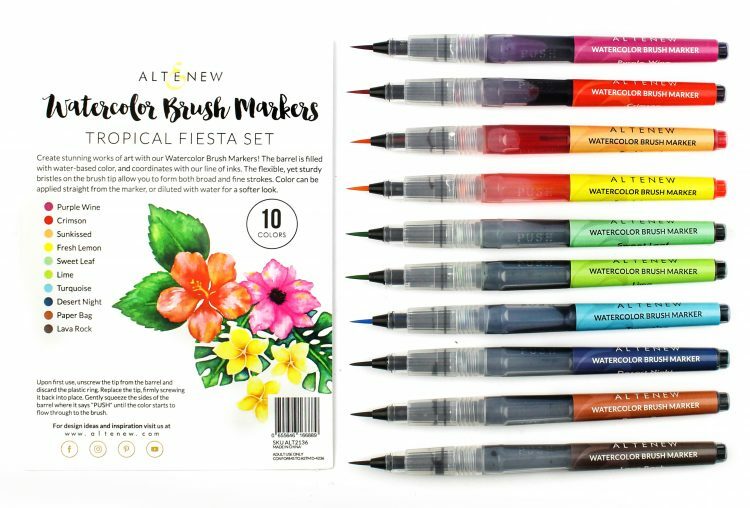 Hello and welcome to my stop on the Altenew March release blog hop, featuring a brand new edition to the watercolor brush markers collection: Tropical Fiesta! This set just makes me HAPPY! 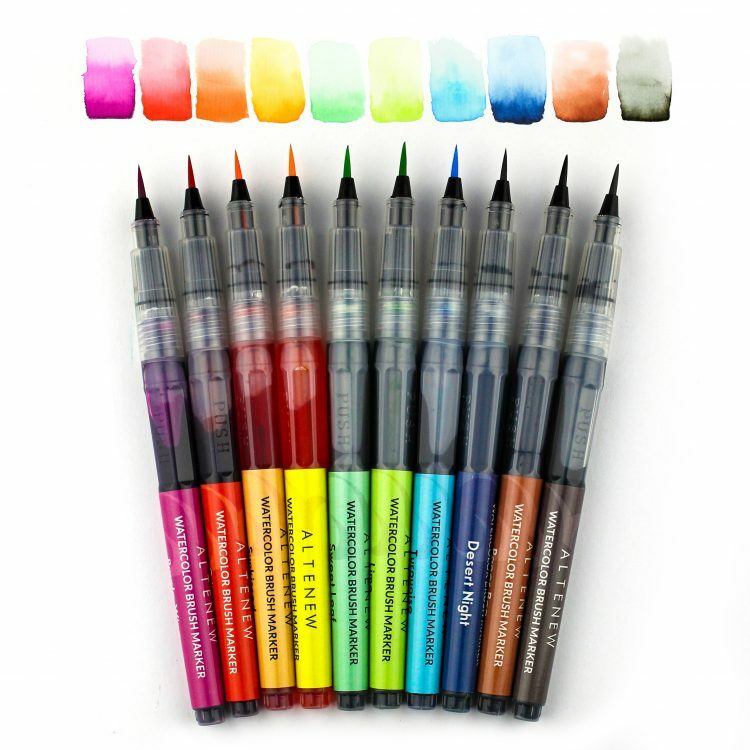 Look at these beautiful colors! That turquoise! I’ve been waiting for this color for so long! YEAH! Annnnnnd I have a critter card with the paper bag and lava rock in the works to share soon! My card today is inspired by the superbloom that’s happing right now — oh how I wish I could be out there. But stamping it is the next best thing, right? 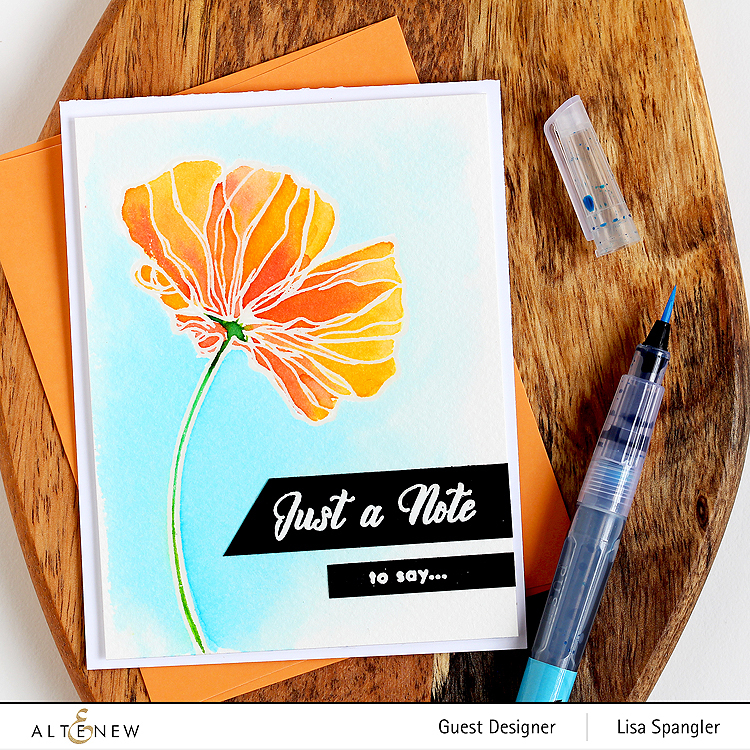 I used the absolutely gorgeous Wonderland stamp set and matching dies on this card — pick them up as a bundle and save! To color the flower, I used a mix of crimson, sunkissed and fresh lemon on the petals and then lime and sweet leaf on the stem. Love how these colors blend together. Then I just had to use turquoise for the background — love this color so much you all! It was super easy to get this nice soft blend — I just wet the paper first, then ran the maker along the edge of the stem and used a wet brush to pull the color out. The BIG key here is to use high quality watercolor paper — I used Arches cold press. Can’t stress this enough — if you use a student grade paper it will be super hard to get a nice blend. 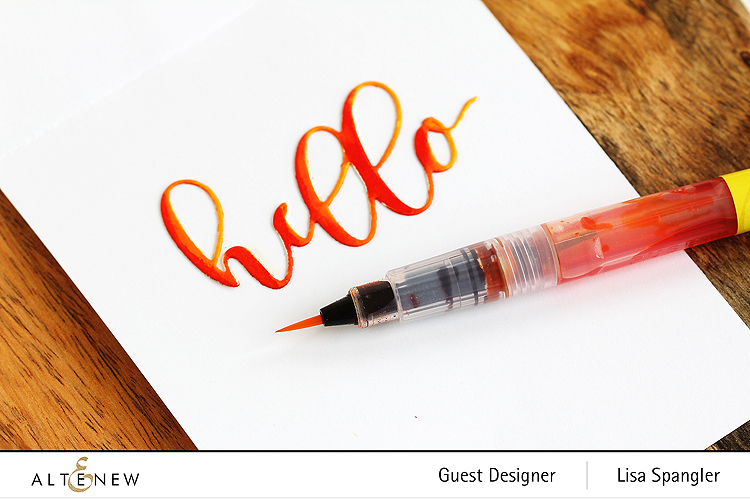 To finish off the card I added some white embossed sentiments to the front (also from the Wonderland stamp set) and then I die cut the “hello” from the Flower Arrangement die set — this set is great to have in your toolbox, I find myself reaching for it all the time. I thought about adding some sequins to the card, but then I decided to keep it clean and simple to really keep the focus on the coloring. And that was that. We’ll also draw a winner to receive a $20 gift certificate from the comments left on each designer’s blog on the blog hop list below. 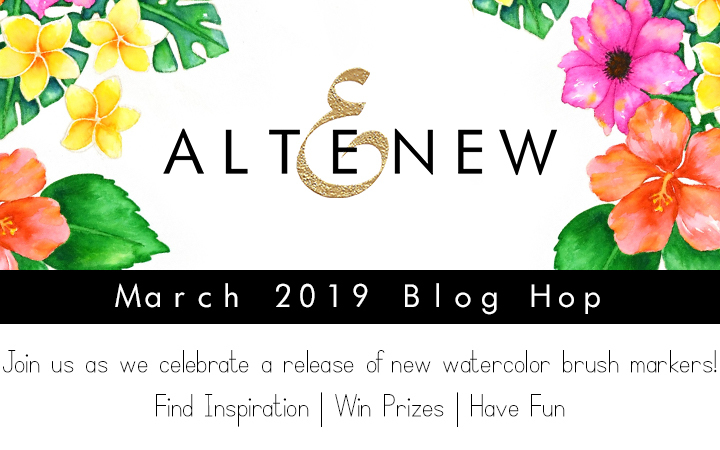 All winners will be announced on the Altenew blog on 3/31/2019. 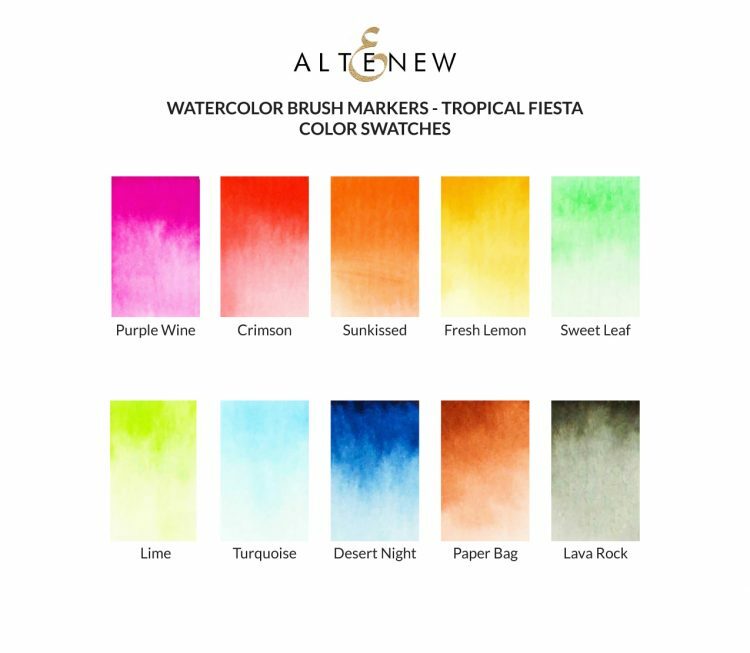 Find the new Tropical Fiesta Watercolor Brush Markers right HERE on Altenew! Thanks so much for joining me today, and happy spring! Beautiful! I love the gorgeous colours of this set and love the contrast of those warm orange/yellow tones of your bloom with that gorgeously fading turquoise background – fabulous job! Your background is seamless!!!! Looks fabulous. How pretty, love the orange on the sentiment! I love the simplicity of your card. It’s very pretty! Love the vibrant colors. You have created such a beautiful flower. Bring on Spring. Stunning, what an awesome card, great job on the water coloring…. Super card, Lisa! These colours really bring your flower to life! Love these bright new colours! Thanks so much for sharing and the great inspiration! Such a pretty card! Thanks for the chance to win and sharing. Fabulous card! and that background! wow! I love this combination of orange and blue, Absolutely gorgeous! Amazing card! Sweet, fresh and fabulous, such a gorgeous design.